The need for a professional organisation to assure the maintenance of a high standard of professional and ethical practice had been recognised since the late 1950s. In 1957, the Academy of Medicine was duly founded in Singapore with the then Professor of Medicine, Sir Gordon Ransome, as its first Master. Unlike the Colleges in the United Kingdom and Australia it was decided that in the context of our country it would be more appropriate to form a specialist organisation embracing all specialities. In order to maintain a high standard of professional and ethical practice, entry into the Academy of Medicine was based on stringent requirements. Candidates had to have recognised higher professional qualification and were required to have worked in their respective specialities for a period of five years. Besides this, they should have contributed to a recognised Medical Journal and presented papers at clinical meetings. The applications of the candidates were vetted by the censors who forwarded them to the Council for approval. The Council admitted to Honorary Membership members of the medical profession locally and from overseas. The Council also conferred Honorary Membership on scientists and eminent persons from other professions who had made contributions in different fields of activity. Members are entitled to use the letters A.M. and Honorary Members Hon A.M. after their names. Following the separation of Singapore from Malaysia on 9th August, 1965, an autonomous Academy of Medicine of Malaysia was formed in 1966. It was registered on 22nd December, 1966 under the Societies Act (1966). Like the Academy of Medicine in Singapore, the Academy of Medicine of Malaysia embraces all specialities in medicine. The motto of the Academy of Medicine is "Terus Maju". Ybhg Tan Sri Mohd. Din bin Ahmad, the first Malaysian Director-General of Health, was elected the first Master of the Academy of Medicine. The founder members were to be the specialists from Malaysia who were already members of the Academy of Medicine in Singapore. In 1989, DYMM Seri Paduka Baginda Yang Di-Pertuan Agong, Sultan Azlan Shah, graciously consented to become Patron of the Academy of Medicine of Malaysia. One of the important activities of the Academy is to provide a forum for members and colleagues in Singapore and Malaysia to share their experiences in their research and their work in clinical, para-medical and related fields. The first Congress of Medicine was held in 1963 in Singapore and it was initially planned to hold these congresses only once in two years. The Third Congress was held in Kuala Lumpur in August, 1967. These congresses became such a success that by 1969 it was decided to hold these Congresses annually and alternate the venue between Singapore and Kuala Lumpur. When the Congress is held in Singapore it is called the Singapore-Malaysia Congress of Medicine and when it is held in Malaysia it is called the Malaysia-Singapore Congress of Medicine. On each occasion it is customary for the Master of the sister Academy to be the President of the Congress i.e. the Master of the Academy of Medicine of Singapore is the President of the Congress when it is held in Kuala Lumpur and vice versa when the Congress is held in Singapore. These Congresses grew from strength to strength and interest in it spread beyond our national boundaries not only to our neighbours in Asean but also to our sister Colleges in Australia and the United Kingdom. Gradually, joint meetings were held between the Academics and the Colleges in the United Kingdom and Australia. At the 23rd Malaysia-Singapore Congress of Medicine held in October, 1989 in Kuala Lumpur there was active participation by the Fellows of the Royal College of Surgeons of England, including the College of Anaesthetists and Faculty of Dental Surgery. In 1991, we are having a similar combined meeting with the Royal College of Surgeons in Ireland and the Royal College of Physicians of Ireland. The roll of the distinguished Honorary Members includes YAB Datuk Seri Dr. Mahathir Mohamed, Prime Minister of Malaysia, the late Tunku Abdul Rahman Putra Al-Haj, the first Prime Minister, the late Tun Abdul Razak, the second Prime Minister, the late Tun Dr. Ismail, former Deputy Prime Minister of Malaysia and the late Tun Tan Siew Sin, former Minister of Finance. Amongst others, YABhg Tun Mohd. 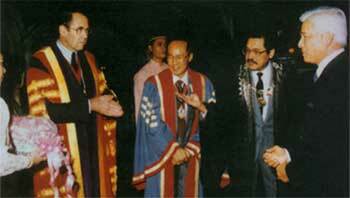 Suffian b. Hashim, former Lord President of Malaysia, Sir Ian Todd, former President of the Royal College of Surgeons of England, Professor Michael Rosen, President of the College of Anaesthetists in the United Kingdom and Sir Raymond Hoffenberg, former President, Royal College of Physicians of London. 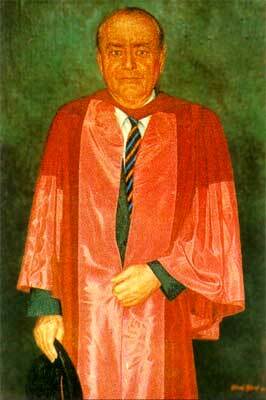 In 1974, the Academy of Medicine of Malaysia inaugurated the Tun Dr. Ismail Oration in memory of the late Deputy Prime Minister and Honorary Member of the Academy. In 1982, with an annual grant from the Kuok foundation, a Research Award was established and named the Tun Abdul Razak Research Award after our second Prime Minister. The academy of Medicine of Malaysia initiated the Young Investigator's Award in 1976 to encourage young doctors to participate in the proceedings of the Malaysia-Singapore Congress of Medicine. The aim of encouraging younger doctors in Malaysia to pursue research was felt important enough for the Royal College of Physicians to sponsor, from 1989, a joint medal and a cash grant of ê 500 for the best research effort in clinical medicine. As part of its continuing medical education program the Academy sponsors and organises symposia on medical and paramedical topics. Since 1979, it has introduced quarterly scientific meetings where doctors are able to present their work. These scientific meetings are held in the various state capitals of Peninsular Malaysia. Unlike the Royal Colleges in the United Kingdom, Australia and Canada, or the Academy of Medicine, Singapore, the Academy of Medicine in Malaysia has no legal right to have postgraduate courses, conduct examinations and award degrees or diplomas. The activities of the Academy have always been centered around conducting continuing medical education, stimulating research, and holding the biennial Malaysia-Singapore Congress of Medicine. These activities, however, have been recognized by the Government and because of that, the Academy has been awarded special recognition by the Ministry of Education. Three Universities in Malaysia conduct postgraduate medical course, namely University Malaya, University Kebangsaan Malaysia and University Sains Malaysia. University Malaya set the ball rolling in the early seventies with courses such as Master of Pathology, Master of Psychological Medicine and Master of Public Health. These were 2-year courses serving to produce specialists badly needed by the country at that time. The three Universities also conduct adhoc short training courses for young doctors sitting for the MRCP and FRCS or FRACS of the Royal Colleges in the United Kingdom and Australia. In the early 1980's, University Kebangsaan Malaysia started their Master of Surgery in General Surgery, Orthopaedics, Othorhinolaryngology and Ophthalmology programmes. These were quickly followed by the Master of Obstetrics and Gynaecology, master of Medicine in Paediatrics, Internal Medicine, Anaesthesiology, Psychiatry and Radiology. The last Master's course to be started was the Masters in Pathology University Sains Malaysia followed suit with their 4 years' Master of Medicine programme. Thus, there are three Universities each conducting their own postgraduate medical specialist training programmes. Each University has its own educational philosophy, intake criteria, core subjects and topics, examinations and duration of study. The only agreement was the name given to the degree, i.e. Master of Medicine, Surgery, etc. The Ministry of Health and Ministry of Education were obviously concerned about these developments and initiated several discussions between the Universities, in an effort to get a unified approach, programme of education, examinations, duration of study, etc. These led to the agreement between the Universities to have a common duration of 4 years' programme, to take in candidates who have had at least 2 years' postgraduate experience and to agree to form a Conjoint Board, Postgraduate Medical Education, based at the Ministry of Education. This Conjoint Board will be the highest authority in determining whether a postgraduate medical course can be conducted, and will work towards the unification or similarity of standards between the postgraduate courses conducted by the three Universities. The Conjoint Board consists of the Dean and two representatives of each University (Faculty of Medicine); the Director of Higher Education Division, Ministry of Education; Director of manpower and Training Division, Ministry of Health; and the Master of his representative, Academy of Medicine. Thus, the Academy has been given the status to help guide and coordinate all Postgraduate medical education courses in Malaysia conducted by the three Universities. The Conjoint Board has set up specialty Boards in Internal Medicine, Surgery, Orthopaedics, Radiology, etc. each entrusted to co-ordinate the programmes of its specialty, The Academy of Medicine has a representative in each of these Specialty Boards. Representatives from the Academy also participate in the selection process and examinations of the various Masters programmes conducted at University Kebangsaan Malaysia. It is envisaged that the Academy will continue to be represented and to contribute towards the success of the various Master's programmes at the three Universities co-ordinated by the Conjoint Board. In 1990, the Government was kind enough to offer to the Academy a building near the Houses of Parliament. This building is to house the facilities of the Academy and plans are underway to establish a permanent headquarters for the Academy of Medicine. It is also proposed to establish in this building a History of Medicine Complex where a large portion of the historical display will be devoted to trace the development of medicine in Malaysia. It is proposed to dedicate this complex to the memory of our first Prime Minister and Honorary Member of the Academy, the late Tunku Abdul Rahman Putra Al-Haj. One of the great advantages of the Academy of Medicine is that it embraces all specialities. With the establishment of Chapters or Colleges the individuality of each specialty can still be maintained. Although we will remain an autonomous and independent body the Academy will continue to play an active part in continuing medical education and specialist training in close collaboration with the there Universities in Malaysia and with the Government to fulfill the objectives of the Academy of Medicine, namely, the establishment of the highest professional and ethical ideals of medicine. Back Row: Dr. M. Jegathesan, Ybhg Dato' A.K. Abdul Hamid, Ybhg Dato' Dr. S.C.E Abraham, Dr. Joginder Singh, Dr Kenneth Chin, YBhg Dato' Dr. M. Kanagalingam, Ybhg Dato' Dr Khalid b Abdul Kadir and Dr. Ridzwan Bakar. Front Row: Ybhg Datuk G.A. Sreenevasan, YABhg Tun Dr. Awang Hassan, Dr. Lim Say Wan, DYMM Seri Paduka Baginda Sultan Azlan Shah, DYMM Raja Permaisuri Agong Tuanku Bainun, Ybhg Dato' Abu Bakar Suleiman, YB Dr. Lim Chong Eu and Mr. Yeoh Poh Hong.